The Saudi-led coalition’s warplanes have launched several airstrikes on a school in the Yemeni capital of Sana’a on Sunday morning. Four airstrikes hit the Guards School north of the capital city according to Yemen’s Saba news agency. The casualties have not been reported yet. 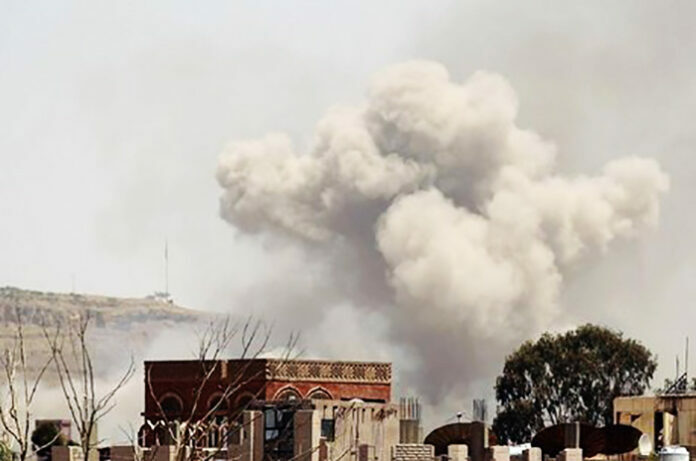 The airstrikes came as two citizens were killed and many others injured in 45 airstrikes by the Saudi-led coalition’s warplanes that hit several Yemeni provinces over the past 24 hour, officials told Saba on Sunday. In Taiz, a woman was killed and others were wounded in two air raids that targeted their homes in Mocha district and a citizen was killed in an airstrike that targeted Mageber area in Moza district. This attack also caused loss to a number of livestock. In Sana’a governorate, three residents, including a women, were injured in a cluster bomb dropped by the Saudi warplanes on Nehm district. Further airstrikes hit the house of a citizen in Al-Majawaha area of Nehm. Two air raids hit Attan area in the capital Sana’a. In Hodeida city port, the aggression launched five airstrikes on Al-Jabana and Ras Aesa areas in Al-Saleef district, and waged two airstrikes on the Naval base, as well as two other raids that targeted the airport and Moshej area in A-Khokha district. In Mareb province, Saudi warplanes launched three airstrikes on Al-Shabwan area in Abeida Valley, and eight air raids on Serwah district. In Sa’ada governorate, Saudi airstrikes targeted Telecommunication network in Al-Khmes area in Sakeen district and two others strikes hit Al-Maghrm area in Baqem district. In Hajja province, two airstrikes hit Mthalth Ahem and three raids struck Al-Mazrak area in Harath district. In Jawf province, airstrikes hit Al-Matoon district and other raids struck Al-Raboah area near the border.